QOTD: What&apos;s all this about "Metering"? Well, this is pretty important if you shoot in Auto mode. When you shoot in Auto, or another mode that determines your exposure for you, you are giving the camera control of the exposure. When you do this, it uses that metering mode to estimate what you want your picture to look like. I am assuming here that your subject is in the center of the frame and is a circle or spherical object, for the sake of explanation. When you select "spot," the camera looks at the very center of the frame, and adjusts the exposure so that the spot is 18% gray. This mode is nice for shooting backlit objects, since the camera will ignore the light in the background, and just meter for the object. Partial metering does the same, but for a larger area of the frame as indicated by the icon next to it. Center-weighted average will take a measure of the entire frame, but give preference to the center area. This mode will meter mostly for your subject, but will also take into account any extremely overexposed or underexposed areas outside of the center area and try to compensate. 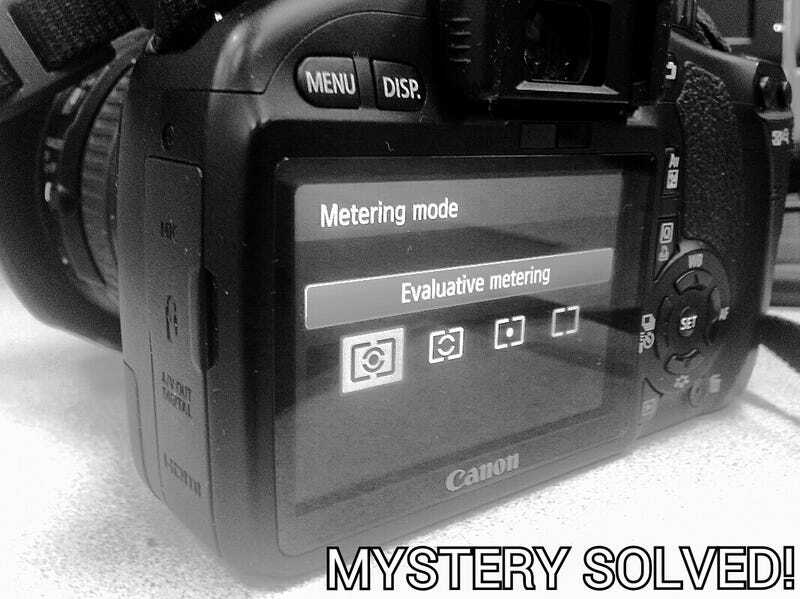 Evaluative metering will basically look at the entire frame and choose one of the options above. Some cameras will just average the frame against 18% gray and you will generally get very standard "snapshot" type photos, as the camera won't be willing to underexpose shadows or overexpose highlights. For example, this will usually underexpose lighter skin tones. If you shoot in Manual exposure mode, as I do, metering becomes a sort of a guide, and I believe you would generally want to stick with Partial or Spot metering. This enables you to check any area against 18% gray, just by pointing the camera in most cases. It will measure the light and let you know if you are underexposing or overexposing, but it will leave your settings alone. Just in case you know what you're doing. As usual, if someone out there is an actual expert on metering and I have been spewing lies, please let me know! So essentially, he's telling me, that since I shoot manual mode 99% of the time, metering mode is just something I should take into account when reading the light meter. D'oh, I didn't even think about linking the two together. (Seriously.) Great answer!